Vacheroy lies in the heart of the French countryside. 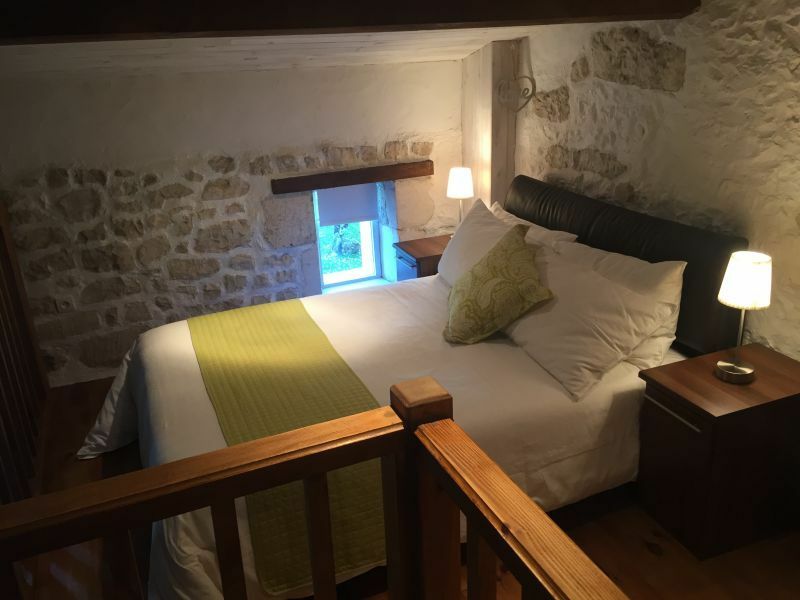 Our Gite sleeps a maximum of 8 people in a romantic mezzanine double, a spacious en-suite twin room, a loft room ideal for one or two children & a downstairs room with bunk beds. 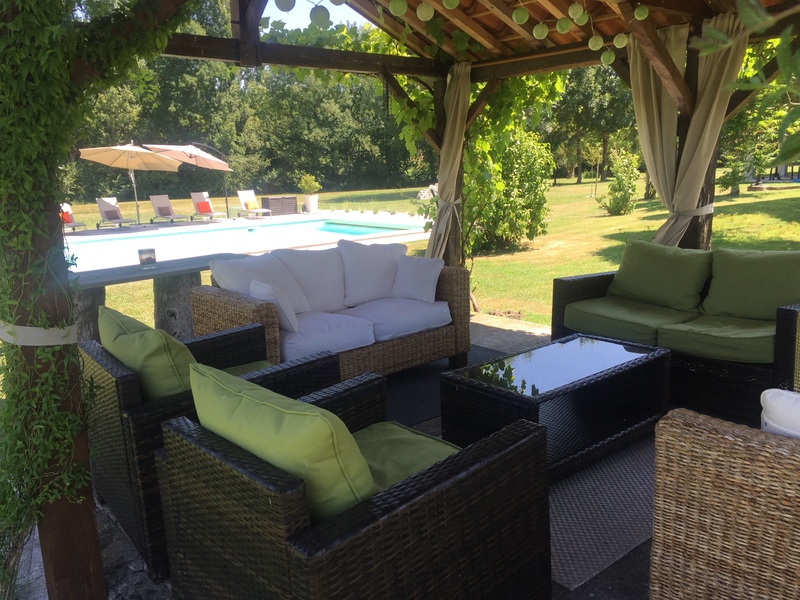 Our gite has all you need for an amazing luxury holiday in rural France. In addition to the bedrooms, Vacheroy has a fully equipped kitchen dining area, a large beamed, double height lounge diner & family bathroom with toilet & both bath & seperate shower unit. Outside is a large private, partly shaded patio area to relax on, a large garden for playing games, a shaded gazebo to chill out under & our extensively terraced luxury swimming pool with ample sun beds & umbrellas. Vacheroy is here for you to enjoy & whether inside or out it is fully equipped so you can relax & enjoy your holiday. This includes the free Wi-Fi throughout the cottage and extending outside to all the dining & relaxing areas, including poolside. 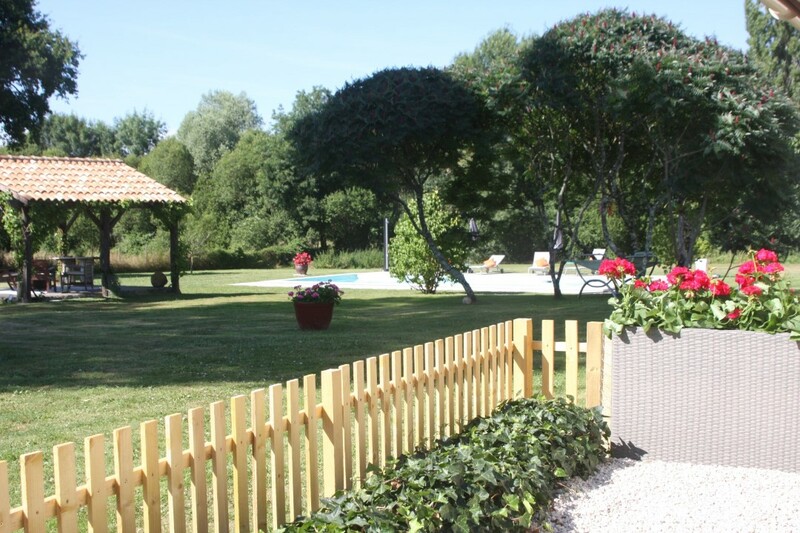 We positively encourage you to post lots of pictures of you enjoying the Gite & pool! Vacheroy gite welcomes well behaved pets at a small supplement, registered guide/service dogs are welcome free of charge. Please make contact to discuss as we do have 2 friendly dogs, a Miniature Schnauser & Cavachon puppy. Our garden is enclosed (as long as you remember to shut the gates) so is dog friendly. We can arrange the necessary trip to the vets prior to your departure from Vacheroy. Vacheroy is a non smoking property. The double height lounge & dining room is the centre piece of the inside of our Gite. 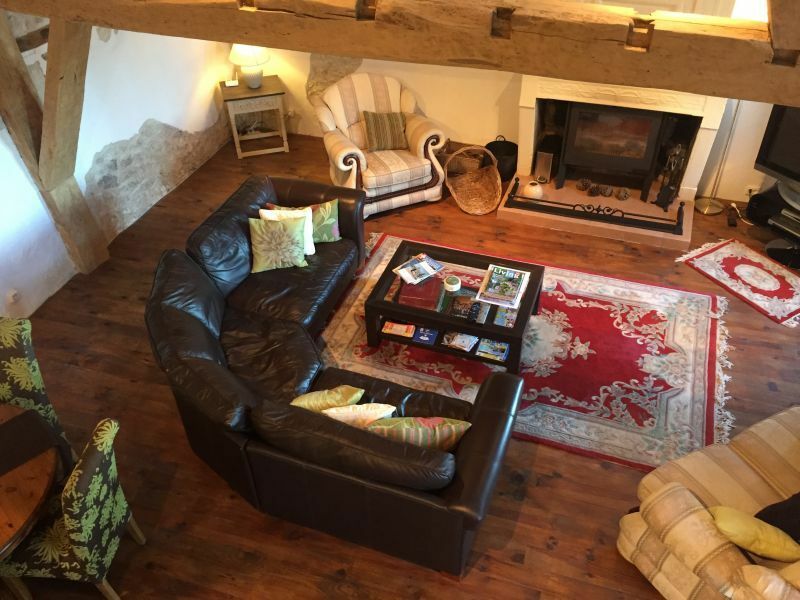 When you see it I’m sure you will love the light airy feel & the beauty of the old Elm beams. The lounge has a large leather sofa, further sofa chairs & a dining table which seats eight. It has a large flat screen TV with English Sky Freeview channels & a DVD player if you fancy a little time inside. The lounge also has a new log burner but we very much doubt you will need any extra heat! The Gite can sleep up to eight comfortably, maximum 4 adults. Above the lounge on a mezzanine, there is a romantic double bed & dressing area. There is also an attic room, with low ceiling height, suitable for up to two children. Downstairs there is a large twin room with luxury single beds & an ensuite shower room & toilet, entered through a connecting room with bunk beds. FROM May 2019 the downstairs twin room will become a Kingsize double ensuite. The Gite is approached through double gates to a large front garden containing a plum tree & flowering hibiscus. The views to the front look out over the fields of sunflowers, wheat or maize towards the church at Sousmoulins that is beautifully lit up at night. At the rear is your private terrace area with outside dining table & chairs, shaded cushioned benches, a wood/charcoal BBQ & sun loungers. At the rear you also have views out over fields to the woods. Additionally, there are two hammocks & a children’s swing set. The highlight of the rear gardens is the brand new 10x5 metre heated swimming pool & decked area. 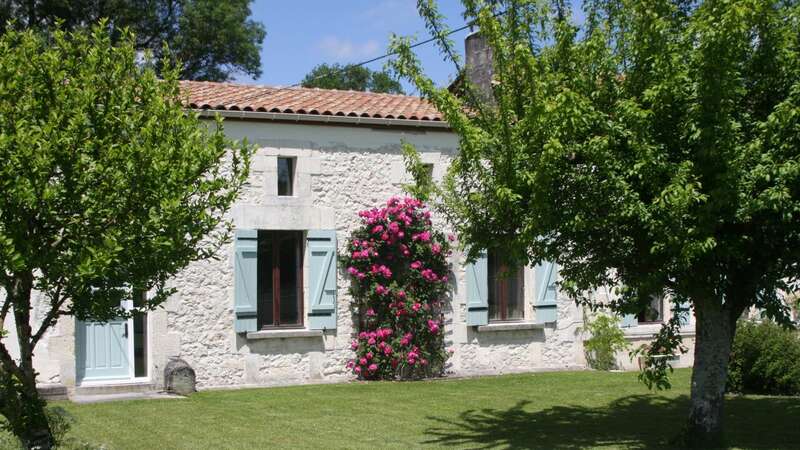 The pool is shared between the Gite & house but generally will be yours to enjoy in tranquility. It’s situated in order to be in full sun from dawn to dusk & has an in-pool seating area so you can soak up the rays, whilst sitting & drinking your sundowners in the cooling water…. The pool is open between 10am & 8pm but those times can be varied by mutual consent. If you need to swim a couple of miles before breakfast who are we to stop you!? The kitchen/diner is newly fitted & has everything you’ll need whether you love to cook a little…or a lot. It is equipped with a new large fridge freezer, a gas cooker, microwave, four slot toaster, washing machine, dishwasher & table & chairs for six. In the cupboards you’ll find all the cutlery, crockery, glasses & kitchen implements you’ll need to cook up whatever feast you fancy. If lounging by the pool is not quite enough & you’re a little more energetic the garden is also equipped with an all weather table tennis table, a slate bed pool table, the traditional French game of boule, a badminton net & racquets & a croquet set. If even that is not enough we have two mountain bikes you are welcome to borrow at your own risk! One men’s & one ladies. If you like to bring your own bikes we can store them securely & this area is fantastic for cycling. The roads here are very quiet & in France cyclists are given the utmost consideration – it’s the law! As a keen cyclist myself I’d be happy to point you in the right direction & suggest itineraries etc. There are many marked cycle routes in the area. If you aren’t able to bring your bikes with you, we can arrange for cycle & accessory hire through www.bikehiredirect.com who will deliver it all to your doorstep.